The nigh unpronounceable Loughareema (Loch an Rith Amach) is, at first glance, nothing more than one of the many lochs and bogs that dot the Northern Irish countryside. That is, if you happen to be lucky enough to see it at all. 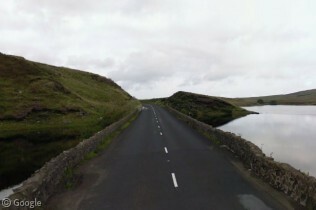 In fact, you could drive down the aptly named Loughareema Road, ply right through the middle of the loch, and still never even know it was there. All existentialism aside, Loughareema is very real and can be visible if seen at the right time. 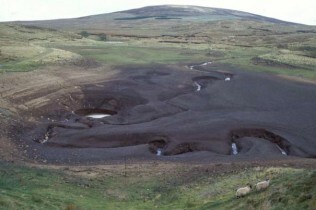 The loch possesses a unique topographical feature known as a chalk “plug hole” that often becomes jammed with peat causing the Loughareema depression to fill. The loch then drains, often quite rapidly until the uneducated passerby would never even know it existed in the first place. 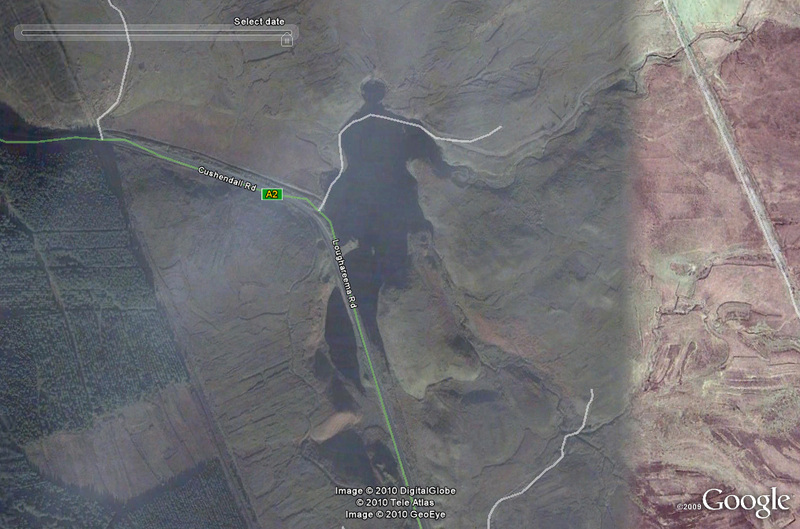 Here we see that the Google Street View car was lucky enough to see the loch in its “plugged” state. For an interesting comparison of Loughareema when it is full and when it is “invisible” take a look at this Google historical satellite imagery. The first aerial photo, taken in 2001, shows only a small stream, whereas more recent photo shows the loch in all its watery glory. It is entirely possible that even the road engineers who built Loughareema Road were fooled by its disappearing/reappearing magic trick. 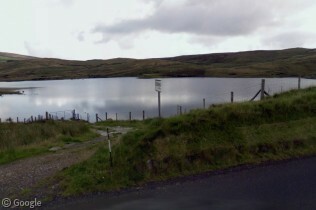 Due to its location right smack in the middle of the loch, the road is often known to be covered with water, making crossing treacherous. It was during a particularly bad state of flooding that, in 1898, a colonel rushing to catch a train in the nearby town of Ballycastle misjudged the depth of the loch’s waters causing himself, his coachman, and two horses to meet a watery end. In fact, local lore states that the coach and its passengers still haunt Loughareema to this very day… of course only when the loch is full! Nice post, Loch an rith amach translated from Irish Gaelic to english means run away lake or lake run away. 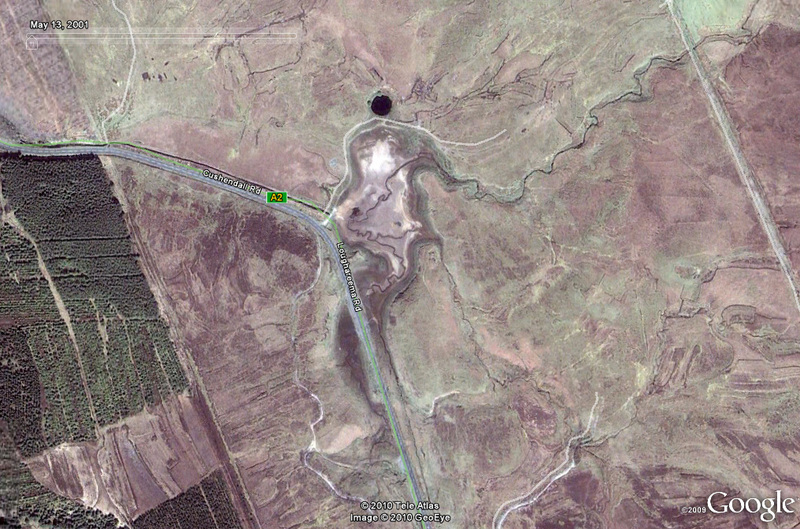 Here are details of a lake close to me that also disappears in occasion. Out of interest, where do you get the historical imagery from? Excellent! I’ve long thought there should be such a feature. I haven’t used Google Earth for a long time, but I’ll try downloading the latest version. Thanks! The historical images in Google Earth are great, but still they don’t have some of the images that Windows Live does, which I’d say date from the early to mid-90s I often compare Google with Windows to see changes, so I wish Google Earth went back earlier than 1999 (which is the earliest for most places except for the grainy 40s images). Ummm, that’s in Northern Ireland, not Ireland, right? You caught me in a classic yankee mistake, Brien. That’s Northern Ireland, UK, not Ireland. I’ll try to get that fixed asap. Thanks for looking out! Great article, unfortunatly the photograph of the empty depression – is uncredited. It is in fact Copyright Mike Simms, and but is available under a Creative Commons Licence – therefore it can be used but needs to be credited. Thanks for taking the time to point this out Barry. Alex S. has added an attribution to the image already, and I’ll make sure that we properly credit photograph sources wherever possible from now on.